Last week we looked at the beaten down energy sector through the large integrated oil companies. While they had fallen much more than the general stock market, they had also staged a much stronger recovery since the beginning of the month. But today they lead the market lower again. As market proxies like the Dow Jones and the S&P 500 index fell by about 1.5%, the energy sector dropped twice as hard. To get a sense of the retail investor sentiment towards these shares, I decided to turn to the pattern of Rydex traders. This sector fund shrank from more than $200 million in assets in June 2008 to less than $30 million. So there is no question that it is out of favor with Rydex market timers. 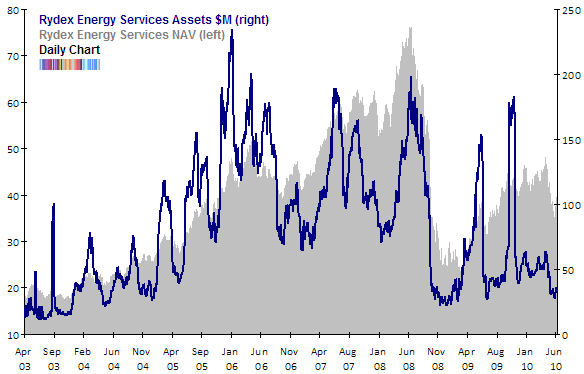 But while they have abandoned energy services stocks, they never really came back into this sector after it bottomed out in late 2008 and early 2009. As you can see from previous patterns, when assets fall sharply in answer to lower market prices, we usually see a significant low formed. But the most recent pattern doesn’t correspond to this. We have seen prices drop but there has been no concomitant asset shrinkage that we can point to. There are two spikes in assets as Rydex investors rushed in and then - just as quickly - out throughout the cyclical bull market that started in March 2009. That makes me cautious about interpreting the low level of assets as a contrarian buy signal. If we had seen assets at around $200 million at the recent top in April and then a drop to these levels that would make me much more optimistic that we had seen a washout of weak hands. However, since we didn’t really see euphoria, it is difficult to say now that this level corresponds with despondency. As a final note, keep in mind that the bullish percent index for the S&P Energy Sector didn’t fall to the extreme low levels that usually have corresponded with intermediate bottoms. In late May the Energy Sector Bullish Percent index fell to just 25%, shy of 20% or lower that we normally see it fall to. For example, in March 2009 it was just 4.4%! And now with the short term bounce in the oil stocks, the bullish percent index is back up to 54%. Right now, the energy group is the lowest risk, highest reward investment - many stocks have formed long bases, and all one need to do is find the strongest relative performers and buy them on oversold conditions. The longer the base, the longer the eventual flight. Off-topic: The S&P 500 is back within that ~1080 congestion. So much for the oversold condition so widely reported. 1) Buying the dips works until it doesn’t. The advice is to research the macro situation before adopting such a trade. 2) Oversold can get more oversold: eg. October 2008. When indicators are at extremes, it is better to wait for a lower low and look for divergences. Of course, this market sell-off will eventually become a good buying opportunity. Off-Topic #2: Check negative divergence of PPO(1,50,9), making lower lows since May 2009. The last low on May 20th 2010 was well below -5%. Percent deviation from MA50 at this level with negative divergence, my friends, is the stuff that bear markets are made off !! 1. If buying dips works, do it - and the one time it doesn’t - don’t you at least break even? Never buying oversold conditions = never taking a chance to make money - oversold conditions have to become overbought conditions eventually. And if you know how to use that oscillator that’s telling you oversold, then you will know whether you should buy or not. 2. Markets were short-term overbought as of last Thursday, but OE kept them going thru Friday and then the high open on Monday got sold into. Never take what the media says, about oversold and overbought, seriously. They don’t know what the hell is going on. 3. You’d have to be a real fool not to buy the energy sector on the next selloff. 4. A better PPO setting for gauging momentum is 50-200-1, on a daily chart, or 10-40-1 on a weekly chart. Primary purpose of using PPO is to measure the spread between 2 moving averages, and it is by using 2 suitable moving averages that one can find divergences. 5. The next drop will be the last great buying opportunity - the worst of the bear market downside momentum is well past. 6. Shanghai has major support at the 2200-2300 area and that’s where the long money is - no short selling there, so a lot of longs waiting for that area. Let me say this first: I know it sounds like I am being too critical, but honestly I do appreciate Babak’s work. I tend to agree with most of it. Your bullet #1: “Never buying oversold conditions = never taking a chance to make money”. That’s not what I meant. Of course you should buy oversold markets under certain situations. My point is this: A mechanical strategy of always buying the dips when indicators are oversold is A) Incomplete (because you are not specifying an exit rule, and therefore cannot quantify the strategy’s results) and B) Less efficient than a strategy which buys the dips but also incorporates selling the rallies when the odds that you are in a bear market increase (you need to define rules for that). You can do your own backtest to verify this. You don’t sound critical to me - you sound like you know your TA mechanics and trading strategy very well and stand behind them. I greatly respect that. Besides, you SHOULD ALWAYS question something that doesn’t sound right to you. If the media says “oversold” when my chart says “overbought”, and my chart NEVER lies, then I listen to my chart. The big problem with the media, and the “expert analysts and chartists”, is that they aren’t always talking in the same time frame. A 10-day CCI is saying “overbought”, as is a 20-day CCI, but a 50-day CCI is NOT saying it, so then, which time frame are they speaking in? What you are saying, I agree with completely. However, when I say “buy oversold”, of course it is includes risk management rules: 1.) stop at a loss; 2.) break even (covering commissions) stop; 3.) trailing protective stop (and this can done on an hourly chart, which shows interim lows). These 3 all constitute exit rules. The 4th is, personally deciding when to sell out. But prices will get overbought, so that is definitely one place to sell out; is it overbought at resistance? Is it overbought but is momentum showing strength? One must use discretion here. My simple point is, prices ALWAYS rotate between oversold and overbought, and it is a matter of knowing when prices are going to reverse from those conditions, that low risk and profitable trades can be made. I know from experience that it is easier to make money buying oversold conditions after selloffs than it is to make money shorting overbought conditions after a rally. It is a more important matter of stepping back and seeing the larger picture, which is what I think you are wisely doing.